Trips to and from Sedona and PHX International Airport in normal traffic are about 2 hours versus about four hours on the bus or a shuttle with a bunch of people. Rush hour will normally add 15-45 minutes (30 minutes on the average). 3 hours and 30 minutes before is normally enough time. The airport recommends you to be there 2 hours early to get through security and to your plane. Boarding usually starts 30 minutes before your plane takes off. However, one hour and thirty minutes is normally enough time. So if the drive from Sedona to Phoenix takes about 2 hours, then 3 and 30 minutes before your flight takes off if normally good. With more than 15,000 customers and a few years in business, Airport Shuttle of Phoenix owns AZ Shuttle Sedona, and has drivers all over the State of Arizona. Our main office is 5 minutes from PHX airport in Phoenix, AZ. How much does it cost to go from Phoenix or Sedona? Please enter the full address to get the most accurate rates between Phoenix Airport and Sedona or vice versa. Book a round trip and you'll get 10% off each way. If it's a one way you can use promo code ONLINE to save 10%. This promo code is only valid on one way trips. If you're booking a round trip you automatically save 10% each way, so you can use discount code NONSTOP instead to get a free upgrade to non-stop. We offer a shuttle from AZ and Sedona locations and other types of transportation like black car and taxi. We customize our shuttle service Sedona to your needs by offering different options like shuttles, black car services, and taxi. We offer many types of vehicles, and different options to make your experience great. Uber and Lyft drivers often cancel once they arrive, because the app doesn't tell them where they are going until they arrive at your home or the airport. Usually drivers don't want to drive that far and not get paid for two hours to drive back, or they are unavailable to work for that long. This may result in you missing your flight after 2-3 of them cancel in a row, and they charge you $5 for each cancellation. You then try to contact Uber or Lyft over the next week to get a refund, and they don't even have a phone number. There is no Greyhound to Sedona AZ. Companies that do shared rides to Sedona will try to pick you up an hour or two earlier, but they make no promises about when you will actually get to the airport. If you're on a tight schedule, the shared ride option with Arizona shuttle or the bus is probably not a good idea. Extra stops and scheduling with other passengers can either make you too early or potentially late. Even with great drivers, passengers can be unpredictable and end up making everyone miss their flight. The Ace Shuttle Sedona operates a lot like a bus. There is no Sedona free shuttle unless you get someone else to pay for your ride. Our Phoenix to Sedona shuttle reviews are awesome. We have a lot of five star reviews from a variety of sources. There are many shuttles in Arizona, so if you search for Arizona Shuttle you will get every shuttle company in AZ. Travel to Sedona from Phoenix is painless with our company. We don't stop over and over again, and it's normally just you in the vehicle. Sedona Phoenix shuttle coupon codes are called promo codes on our site. You can get discounts on both one way and round trips. Arizona airport shuttle to Sedona is non-stop, and offers 24/7 door to door service. Try us out, you'll be very happy that you did. Sure beats riding the bus! Finding an Arizona shuttle coupon can be frustrating, but our promos are always running and easy to access. Use the promo code online to book your trip to Sedona today! Schedule a trip to Sedona from multiple cities throughout Arizona with our Arizona shuttle Flagstaff, Arizona shuttle Tucson, Arizona shuttle Prescott to get you to your destination in comfort. 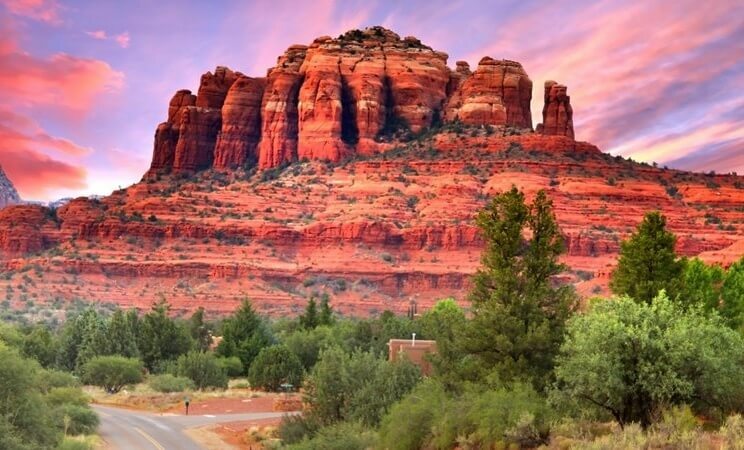 Our Arizona shuttle Phoenix to Tucson service can also take you to Sedona or any other city in Arizona. Lets us get you relaxing faster with our excellent service.